ROB BLAKE JERSEY RETIREMENT: In part 3 of a multi-part series on the Los Angeles Kings retiring superstar defenseman Rob Blake’s jersey number 4 on January 17, Kings television color commentator Jim Fox, who covered Blake’s entire career with the Kings, spoke exclusively with Frozen Royalty. He shared his memories of Blake’s career and his impact on the organization, then and now. Former Los Angeles Kings right wing and current television color commentator Jim Fox. EL SEGUNDO, CA — Early in the broadcasting career of former Los Angeles Kings right wing Jim Fox, who is now in his 25th year as the team’s television color commentator, a tall, lanky defenseman named Rob Blake began his ascent to becoming one of the elite defensemen in the National Hockey League in 1989-90, Fox’s first season behind the microphone. Tonight, Blake’s jersey number 4 will be retired by the Kings. 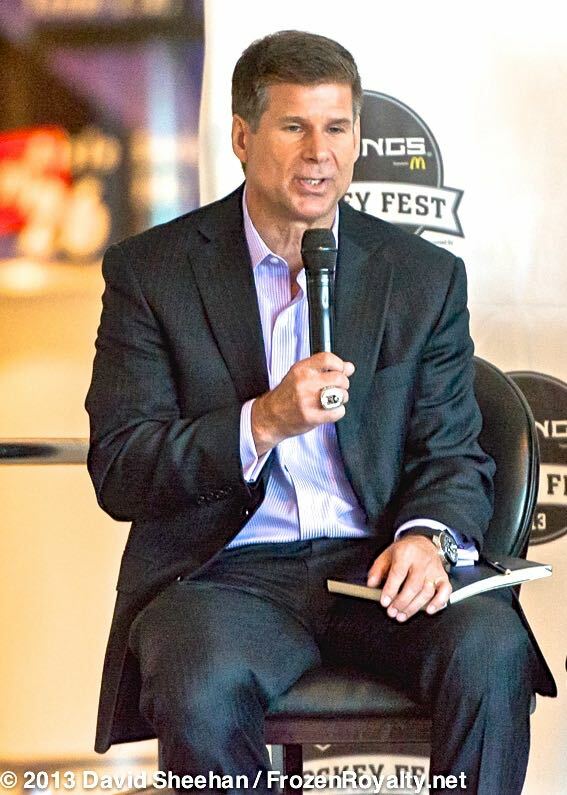 Fox had the opportunity to cover Blake’s 14 seasons with the Kings, along with more than four seasons with the Colorado Avalanche, where he won the Stanley Cup in 2000-01, and two seasons with the San Jose Sharks, where Blake ended his 19-year NHL career. Despite the passage of more than twenty years since Blake broke into the NHL, the memories are still quite fresh for Fox. That hit was rather unique because unlike most players, Blake always used his hip, or rear end, to deliver what was often a devastating hit. Delivering all those big hits did not come without a price—Blake had to fight more than most would probably remember. When asked to name a player who could come close to matching all the skills or weapons Blake possessed, Fox gave a surprising response. Like the Kings’ current players, Fox pointed to Blake’s humility as one of the reasons he has received so many accolades. As gifted and skilled as Blake was, he never got much credit for how much helped his teammates, as Fox alluded to when discussing his humility. Blake’s humility fits the Kings culture like a glove. Fox indicated that there is nothing phony about Blake’s humility.